India vs Australia 3rd Test Melbourne: It looks like Rishabh Pant has become a showstopper behind the stumps already. India vs Australia 3rd Test Melbourne: It looks like Rishabh Pant has become a showstopper behind the stumps already. The stump mic has captured him on a number of occasions being chirpy from behind the stumps and once in a while engaging in light banter. The young Turk is surely enjoying his role in the team. 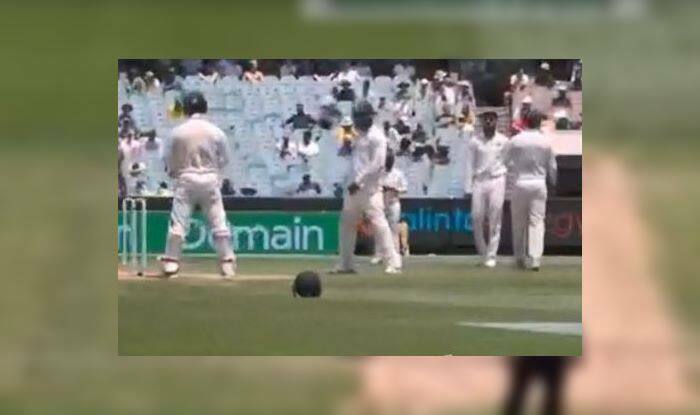 On day 3of the third Test at MCG, he was once again caught being chirpy from behind the stumps when Ravindra Jadeja was bowling to the Australian captain Tim Paine. Pant was advising Virat Kohli to make a certain adjustment in the field to get Paine out and by the looks of it, Kohli obliged. This is something fans are used to seeing MS Dhoni do. Here is the video of the entire episode that took place in the 46th over with Australia reeling at 105 for six. Meanwhile, after this incident took place and India bundled out Australia for 151 in the first innings. Kohli did not enforce the follow-on and opted to bat with a lead of 292 runs. Soon, India was reduced to 44/5, when Rishabh Pant walked into the middle. Pat Cummins and the Australians tried to get chirpy with Pant at the wicket. So, it was Paine’s turn now and he asked the Indian wicketkeeper to join the Big Bash League for the Hobart Hurricanes as MS Dhoni was already picked for the ODI squad. Pant is recently dropped from India’s ODI squad for the upcoming three-match series, starting on January 12, 2019. Paine seems to to be throwing a bait for all India batsman, earlier he said Rohit to hit a six and he would support the Mumbai Indians. But, it seems to not be working for the Australian captain as the Indians are trying to turn a deaf ear to all of that.